Jake runs Telford Foodbank. People are referred by Citizens Advice Bureau, Job Centre and other contact points when they are in desperate need. Forget the shows on TV where lazy people watch 50″ plasmas in between foreign holidays while treating the local Foodbank as a kind of freebie takeaway. This doesn’t happen here. Not in Telford. Neither will you see Telford Foodbank used as a political point. It’s about helping people in dire need, not as an excuse for a dig at Westminster or the Telford & Wrekin Council. Not here. 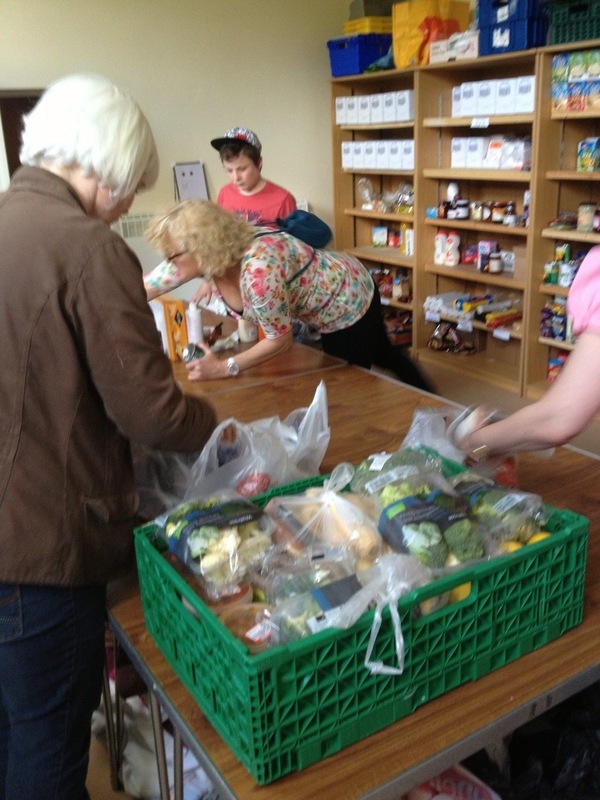 Volunteers make this Foodbank tick like a stopwatch. Every weekday between 5:30pm to 6:30pm is when all the donations are racked and stacked before the picking lists are distributed. The power hour. Donation points are set up all over Telford. Churches, workplaces, council buildings. The volunteers seem to really enjoy preparing the bags containing three days of emergency supplies for a single man, a father and his daughter, a family of three. Good humour, rapid hands and thoughtful meals planned in their heads. Many of the volunteers themselves are families. Mothers & daughters, mothers & sons. One volunteer, Kim, asked me publish her experience as a first time Telford Foodbank volunteer. So here it is. It was ‘Volunteers Week’ last week and to mark the occasion, throughout the month of June, the creator of ‘Telford Live’ is doing four volunteering slots with four different charities. On Friday evening I decided to join ranks and embark on a food packing mission at ‘Telford Food Bank’ in Madeley. I’m ashamed to admit that I did have a few misconceptions about food banks before arrival. I had assumed that anybody would be able to just go in and take what they wanted, and that the service might be abused by some for free food. I had also, naïvely, assumed that in 2013, with the income benefits system in the UK, nobody, or very few would be having to go without food and basic essentials. I later learned that the centre provides small kits to tide families over for a few days in emergency circumstances when benefits weren’t available, like redundancy for example. Families usually only ever need one emergency kit until they are back on their feet again and some families have replaced the food that they had been given after getting back on their feet. 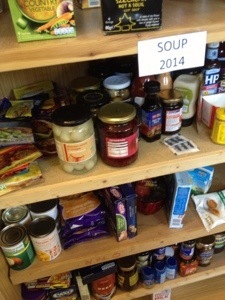 I was made to feel very welcome upon arrival by a team of volunteers who were arranging food onto shelves. The storeroom was organised with shelves of tins and other foods around the edges and a large square of tables in the middle made up a sort of workbench which was piled with generously donated food ready to be organised. After we’d sorted the food onto the shelves, we were each given the task of packing a three day emergency food parcel for a single person who had requested help. We were given a piece of paper which contained suggestions of what to put into the bags and at a list of what the person had urgently needed. The person that I packed for had urgently requested soap and toilet paper, and I was truly humbled that people could be deprived of such basic needs that most of us take for granted. I packed the food, dashing around the room to find tins and dried foods to make up meals for the person to eat. I found myself enjoying putting together the kit as I imagined the pleasure the person on the receiving end would feel. I particularly enjoyed putting the biscuits and treats such as ‘Space Raiders’ into the pack; it would be easy to forget that the person the package was going to, although fallen on hard times, would enjoy the occasional treat. The second parcel that I helped to put together was for two people, one of which was a 14 year old. This struck a chord with me, being 17 myself, and I found myself packing things that I myself would like, had I found myself under similar circumstances. Whatever hard times this family had fallen upon, although I’m sure it was not their fault, the 14 year old was certainly not to blame. I saw another of the volunteers packing for a family with a three year old and it made me sad to think that there are children within the borough going hungry. The work itself was very easy to get involved with and I found the overall experience very uplifting as I knew that I was helping someone, somewhere locally. And after working with a large international charity with strict guidelines, inductions and paperwork last year, it was refreshing to just be able to turn up and get stuck in. The food bank does a valuable service in Telford, and helps people in difficult circumstances that could happen to any one of us. With its enthusiastic team of volunteers and generous donations, it really shows the strong sense of community which I believe makes Telford unique. After all of the packs were made up there wasn’t much food left on the shelves, I noticed a particular shortage of tinned fruit, tinned ready meals, squash and jarred sauces. It would be great if people could donate some of these things so that nobody has to go without. All in all, a very humbling and essential experience that everybody should definitely try for themselves. I know for sure that I will be back again. Have a look at the website http://www.TelfordFoodbank.org.uk and you can find collection points, what’s needed, how to volunteer and how to donate cash.